There was a tradition in ancient Rome to celebrate the return of a victorious military general with a drawn out spectacle to sanctify the triumphant leader. On the day of his parade, the victor wore a crown and a purple, gold-adorned toga, otherwise reserved for kings. His four-horse chariot parted the streets lined with thanks-givers chanting “io Triumphe!” The roars of “Hurray, O Triumph” was muffled by the whisper of slave, positioned deliberately in the chariot behind his master’s throne, “Memento Mori, Memento Mori, Memento Mori,” the slave echoed. “Remember thou art mortal.” “Remember, you too must die.” The perfect reminder during a man’s momentary immortalization. The mediums by which Memento Mori reminders are expressed has progressed over time, but the comprising symbols have not altered. Skulls, hourglasses, skeletons, candles, and flowers, whether on a tombstone or a necklace, have long captured life’s fragility, time’s haste, and death’s certainty. While some put a painting on their wall or a skull on their desk, others opt for a more permanent piece of art. One they can’t leave home without: tattoos. Etching pigments on the body dates back tens of thousands of years, as evidenced by tattoos found on mummified preserved skin. The purpose of body art varies culturally and historically. They’ve been sources of healing, rebellion, punishment, allegiance, expression, and remembrance. Trends shape the story of humans. 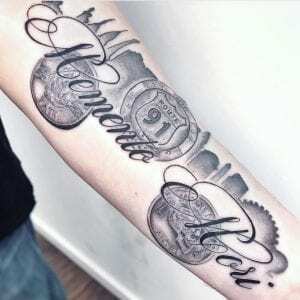 Memento Mori tattoos are trending. Harry Styles, Adam Levine, Rihanna, Miley Cyrus, Ellie Goulding, Kesha, and Johnny Depp are just a few pop culture icons wearing reminders of death on their skin. 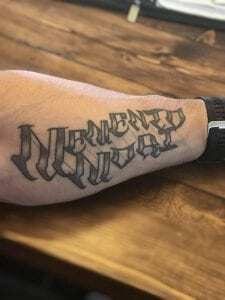 DailyStoic reached out to readers to find out how they are remembering mortality through permanent body ink. 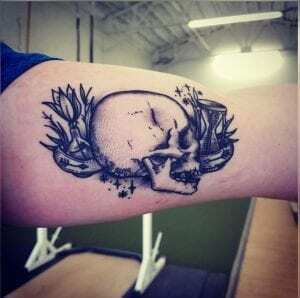 Below is a collection of some Memento Mori tattoos and the stories behind them. “I started learning about Stoicism in early 2017 and most everything almost immediately rang true in my life, especially Memento Mori. Working in law enforcement in this day and age, it was a concept I probably thought about everyday. 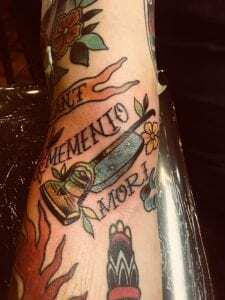 I’ve always wanted my tattoos to have deep meaning and I couldn’t think of something more fitting than the Memento Mori and Amor Fati medallions along with the Route 91 logo and a Vegas skyline. Tattoo done by Johnny Bravo (IG: @whoisjohnnybravo) at The Raw Canvas (IG: @therawcanvas). 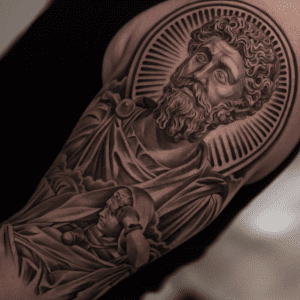 “I originally got this tattoo sleeve done before studying any Marcus Aurelius or Stoicism. Once I read his Meditations it was a complete reflection of my beliefs, like the few represented on my arm. 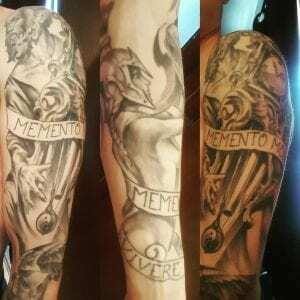 The top half of the sleeve represents reflection of death (Memento Mori), philosophy, and grabbing hold of and controlling your time. Time will balance everything eventually whether you will it or not (Yin-yang within the clock). 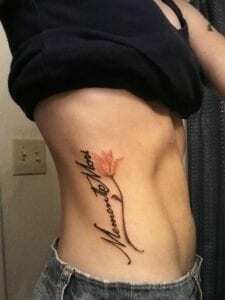 The bottom represents reflection of life (Memento Vivere), growth of wisdom, and attaining victory. Plato: One of the great philosophy kings, he is simply meant to represent deep philosophy and control of outcomes. Grandfather Clock: Plato is holding onto it because philosophy and thought will put you in complete control of whether the outcome of your time spent matters or not. It also represents the impending death, the same death we all face regardless of religion/philosophy, or lack thereof. On the bottom is Athena: Greek Goddess of Practical reason, wisdom and warfare. Her owl represents wisdom as well, along with erudition and perspicacity. She’s releasing it as an action of free thought, and release of the mind to carry you through life and into what comes after. “Before diving into Stoicism I really struggled with understanding my personal core values. I lacked a framework of which to contextualize and gauge my life experiences with. 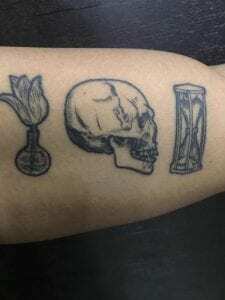 After adopting Stoicism as that framework – things began to shift for me – and a huge shift came when I learned the concept of Memento Mori. ‘You could leave life right now….’ that one hit home, and it hit hard. Aside from reading a days message from The Daily Stoic by Ryan Holiday every morning – I actively spurred myself to really consider those words from Marcus Aurelius. To contemplate mortality in a way that almost forces me to live. To not simply fear death, but to embrace life. 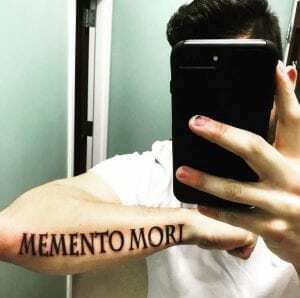 I thought many times of ordering the Memento Mori Print from dailystoic.com as a daily reminder hung upon my wall – but I chose to dedicate myself a bit more fully – and wear it on my skin. Now it’s with me constantly. And unless I lose my arm…always will be. My beautiful wife is to thank for making it happen. 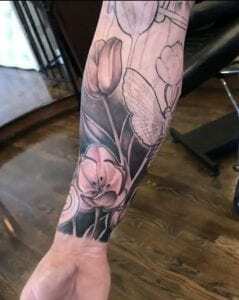 She scheduled the session and paid for me to have it done by our tattoo guy (Gerrit Verplank @Firefly Tattoo Collective in Indianapolis) for our 10 year wedding anniversary :). “When I was failing college and lost in life, I stumbled on the path of becoming a writer. My second year into the craft, I had great momentum—self-published my first book and finished attending Seth Godin’s three-day seminar that fundamentally changed my life. Toward the end of the year, my psoriasis (didn’t knew I had it) flared up, blanketing my entire body. I fell into a deep depression. I was recommended the book, Meditations by Marcus Aurelius, and it gave me the framework and energy to flip this experience on its head. That year, I barely left my room, read a book a week, and devoted my time to writing and meditating. My dermatologist, after all, said there was no cure, only lowering my stress. I remember being at my best friend’s house, watching Ink Masters, and he asked if I would ever get a tattoo. And I explained to him exactly what you see on my arm today. Jun Cha is my artist, and at the time he had a three year wait—it was also application only. I got this tattoo of Marcus Aurelius, Nero, and Seneca because it’s a reminder that no matter how smart you may be, no matter how good of a support system you may have, ego can always win. Marcus sits at the top because he’s the North Star, the reminder of how to behave and what to return to when things go awry. Nero had potential to be a great emperor—his first five years were fruitful—but ego won. Seneca is one of those people I deeply admire for his thought but also his story. 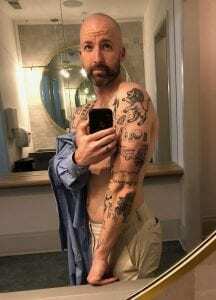 “Here’s my story behind the tattoo – it’s part of a broader sleeve of personal ‘glyphs’- images that tell the story of my 30s. Every picture represents an idea, experience or lesson learned. I intentionally refrained from tattooing any actual words, as I wanted the meaning behind each tattoo to be able to evolve over time. Stoic philosophy really grabbed hold of me a few years ago as I was wrestling with my own religious and spiritual background. Trying to reconcile the way I experience the real world around me, and the narrative I was taught all through my childhood and young adulthood. Tattoo done by Jennifer Lynn (IG: @jenniferlynntattoo) at Trilogy Tattoos (IG: @trilogytattoogallery). 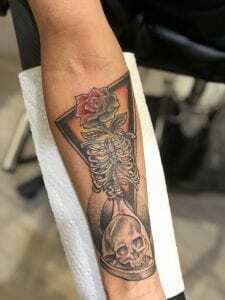 The tattoo was done by Jack at ‘Black Poison Tattoos’ in Ahmedabad, India. 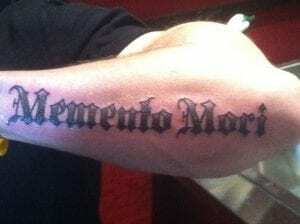 Check out Shawn’s story on why he got a Memento Mori tattoo here. 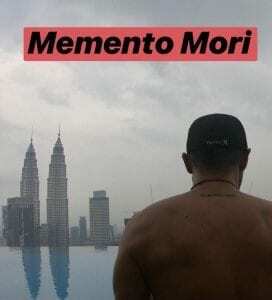 “Memento Mori is a very simple instruction. “Remember that you have to die”. Remembering and accepting that I am going to die puts everyday life, struggles, and doubts in a new perspective. 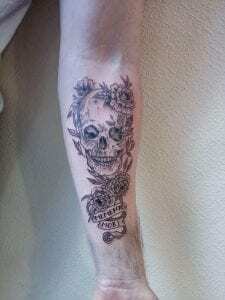 The tattoo was done in Kiev, Ukraine. 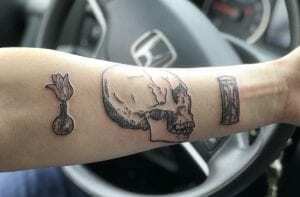 “I honestly don’t know where to start with Memento Mori. Familiarizing myself with Stoicism has been one of the largest, positive, influences that I’m proud to have incorporated into my life. I used to (still do) have moments where I’d be doing something mundane and the thought that I would cease to be alive would just pop into my thoughts. And that realization is a very profound experience if you allow yourself to explore it and understand why you feel the way you do about it. But, facing it head on and choosing to continue your life with it in mind, and in a positive light, has been very humbling for myself. We should all ponder what we want to leave behind in this world, no matter what that might be. Tattoo done by Timm Nasario at Yer Cheat’n Heart in Hermosa Beach, CA. Tattoo done by Alonzo Villa (IG: @alonzovillatattoo) at Guru Tattoo (IG: @gurutattoo). My tattoo artist is Tito Aguayo in Orlando (IG: @titoaguayo85). I shared with him what Memento Mori is and what it means to me. We spent a month or two conferring on this design before getting started. Zoom in for the gorgeous linework and white ink details! As we are reminded of death all around us, will you ignore your human reality? Or do you think it’s time to see death and dying in a new light? Please share if you think the world needs this new perspective! Also, if you have a stoic tattoo you’d like to share, please email it with the story of why you got it to info@dailystoic.com. Thank you to all who shared pictures and thank you for reading!